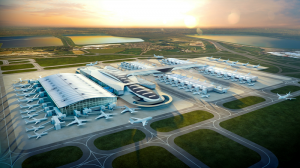 The Arora Group has unveiled its plans for new terminal buildings at London Heathrow Airport, which it says will be a cheaper way of dealing with the increased number of passengers than Heathrow’s own plans. Arora Group, owned by hotelier Surinder Arora, is bidding to undertake development of Heathrow’s expansion. Their Coran Arhitects designed ‘Western Hub’ plans, they say, are designed to provide capacity for over 50million additional passengers and would “transform passenger experience and efficiency at the UK’s premier gateway to the World”. Their cost estimates are £14.4bn to expand the airport to full capacity. They say Heathrow Airport’s plans have been costed at more than twice this sum by the Airports Commission, although Heathrow’s own cost estimates are similar, at around £16bn. Arora say their plans would make airport expansion affordable and give Heathrow the best chance of success when competing with other hub airports, such as Amsterdam Schiphol and Paris-Charles De Gaulle, post-Brexit. Heathrow has recently announced a partner search, saying it would allow companies to bid to partner with it on various parts of the expansion scheme. Arora say this is a step in the right direction but “does not go far enough in guaranteeing a truly competitive expansion”. The Arora proposals concentrate new terminal capacity on the western side of Heathrow, between the existing Terminal 5 (T5) and the M25. This, they say, avoids the need to redevelop existing terminals in the Heathrow central area (Terminals 2 and 3) which they believe would be far more expensive and disruptive. Instead of new, independent terminal buildings, the Western Hub integrates new passenger facilities with T5 into a single hub campus. At the heart is a new central concourse, would serve all 85m passengers using the Western Hub. This building would include a rail interchange. The central concourse will provide fast and easy access to both Terminal 5 and to the new Terminal 6, with an elevated bridge concourse. Surinder Arora, Founder & Chairman of the Arora Group, said: “Our approach has been to work closely with airlines and to employ the world’s best and most experienced airport designers and these benefits are clearly evident in our Western Hub plans. Heathrow has been in monopoly control for too long and our proposals show what can be achieved through an alternative approach and Heathrow fully welcoming competition. “We welcomed Monday’s consultation from the CAA. It is helpful to have talks in place and we are eager to work with all parties to realise the best solution for Heathrow. Arora say their plans would ensure less road congestion, with all new terminal capacity located on the western side of Heathrow, close to the M25, avoiding bottlenecks associated with the M4 spur road and tunnel; and that their integrated rail/air interchange within the central concourse, linking Heathrow to existing and new rail networks would be a key factor in enabling the Government’s requirement for a step change in public transport use and environmental compliance. A spokesperson from International Airlines Group (IAG, the holding company of British Airways, Aer Lingus, Iberia and Vueling) said: “Competition at Heathrow is critical to keeping costs low and we call on the Government to break up the airport’s monopoly and allow third parties to run terminals. The Arora proposal looks very interesting and deserves to be properly evaluated so that customers can get the best facilities at the most affordable price”.